When Kleiber returned to Europe in February 1948 after an exile, mainly in South America, that lasted for 13 years, it was not to Berlin but to London. There he gave concerts with the London Philharmonic and made his first gramophone recordings in a decade. The same trip brought him to Stockholm in March for the sort of engagement that Kleiber tended to favour in his last years - a less than world-class orchestra but one that gave him its full response and ample rehearsal time in a major work. 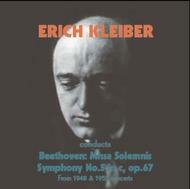 It was only under such conditions that Kleiber would guest conduct Beethoven’s Missa Solemnis. The orchestra in this case was the Stockholm Philharmonic, today the Royal Stockholm and the performance, in which the young Birgit Nilsson took part, was recorded by Swedish Radio and is released here for the first time. The opening ’Kyrie’ is very broadly phrased indeed, probably at the brink of what the chorus could sustain.The ’Gloria’ is not pushed to its limits though, for Kleiber’s art was always about much more than mere speed. The filler offered is Kleiber’s April 4, 1955 Cologne performance of Beethoven’s Fifth, a work closely associated with his name.